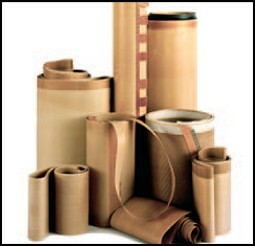 Innotec of WI, Inc. PTFE Belting Materials have been developed for applications that require superior release characteristics, permeability for rapid drying, dimensional and thermal stability, and the dynamic strength to stand up to the most rigorous operating conditions. 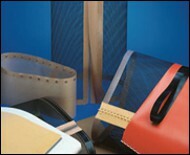 The unique behavior of the materials results in a product that is more practical and cost-effective than conventional belting materials. Premium PTFE Fabric Belting Premium series have a smooth, non-stick surface with the best release, highest dielectric strength and great chemical resistance; fabrics are manufactured from woven fiberglass substrates with the highest PTFE content, and leave little-to-no fabric impression 3 mil, 5 mil, 6 mil, 11 mil, 14 mil N/A N/A Process belts for dough pressing, tortillas, pita bread and pizza. Frying, drying and curing of meats and comestibles, freezing meats and ice cream. 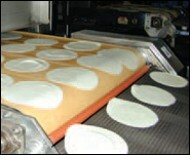 Used in shrink wrap ovens and plastic wrap packaging. Industrial PTFE Fabric Belting Industrial series is the most extensive and most popular belting, utilized in the widest industrial applications; the workhorse of the belting line provides the highest value, offering an excellent balance between heat transfer, release and flexibility 6 mil, 8 mil, 10 mil, 11 mil, 14 mil, 19 mil, 25 mil, 38 mil N/A N/A Polymer casting, lamination, composite manufacturing, shrink wrap ovens, plastic wrapped packaging, rubber curing and vulcanization and general conveying.